Arrival and departure: Normal arrival time is around 5 pm, and departure is by 10am please. 4 bedrooms incliding a dormitory room - kids can all sleep together! 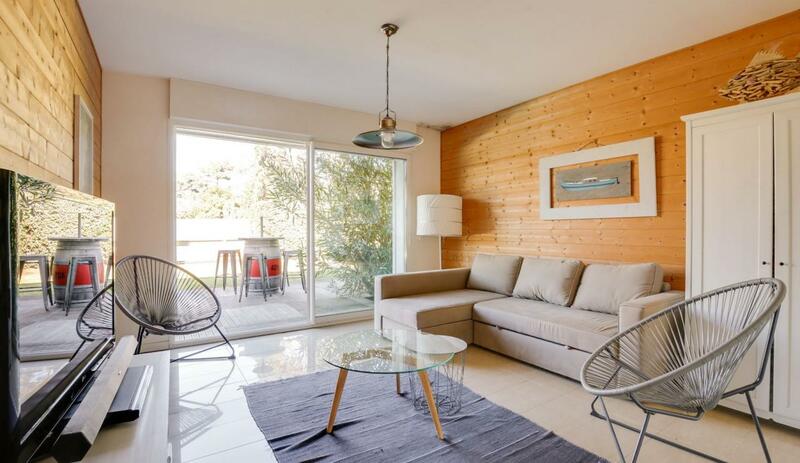 This rental is perfect for families with children of all ages. 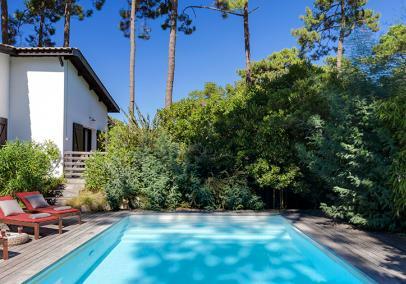 It's a holiday to keep everyone happy - calm bay waters and surf beaches within easy reach, surrounded by fabulous shops and restaurants, and lovely forest cycle trails - a great place to experience the unique chic that is Cap Ferret. Although simple in style, it has a lovely summery vibe and you'll find all the facilities you need for a relaxing stay - even a jacuzzi bath to relax those tired surfing muscles! Toddlers - there are quiet bay beaches within walking distance. Pool is protected by a removable fence. Pool is protected by a removable fence, which will need to be in place for toddlers.. 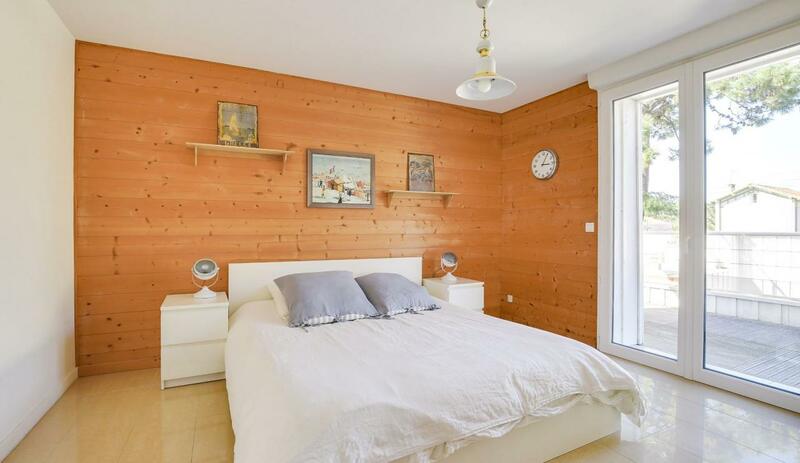 The 220m2 villa is set amongst lovely pine trees, right at the heart of Cap Ferret village. It is a semi-detached property - the other half of the building faces in the opposite direction, and is accessed via a parallel road. Noise insulation between the two houses is good. 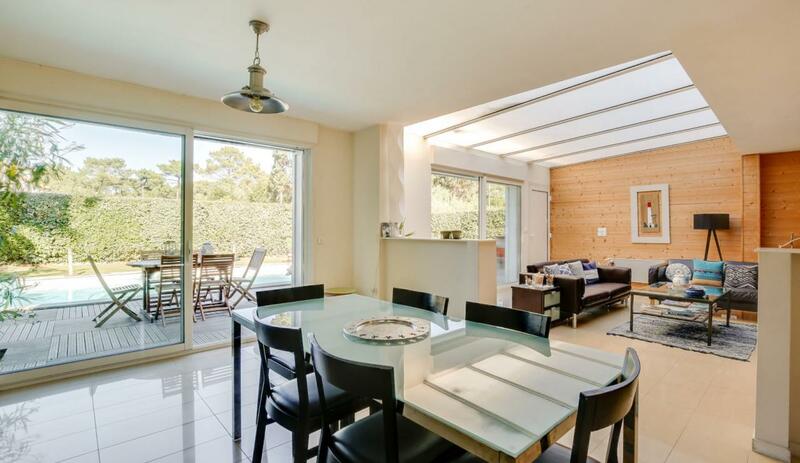 Please note that Villa Escale can sleep up to 10 people, but we feel it is more suited to 6-8 (dining tables have seating for 6 round the indoor table; 8 on the table outdoors). 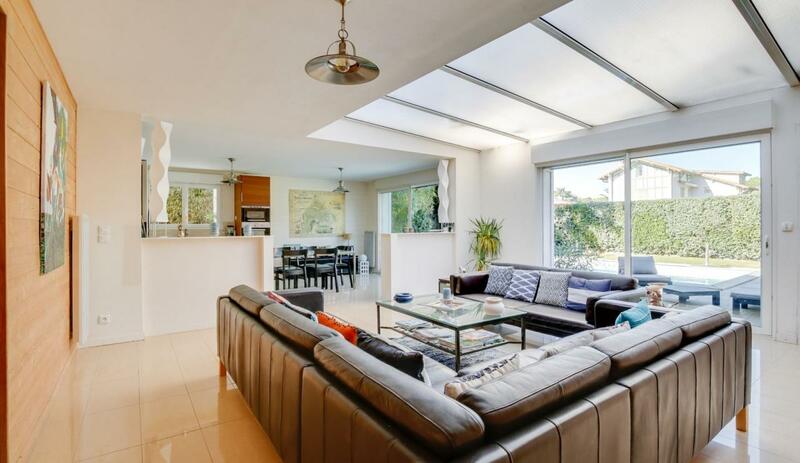 The ground floor accommodation is dominated by the large, open plan living area, comprising a comfortable living/seating area opening onto the garden and pool; dining table and modern kitchen. 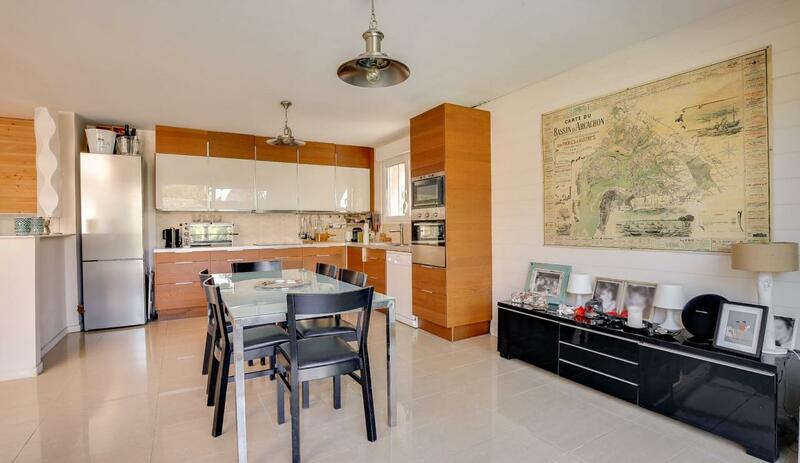 The well-equipped kitchen includes a Nespresso coffee machine, cooker and hob, microwave, washer/dryer. 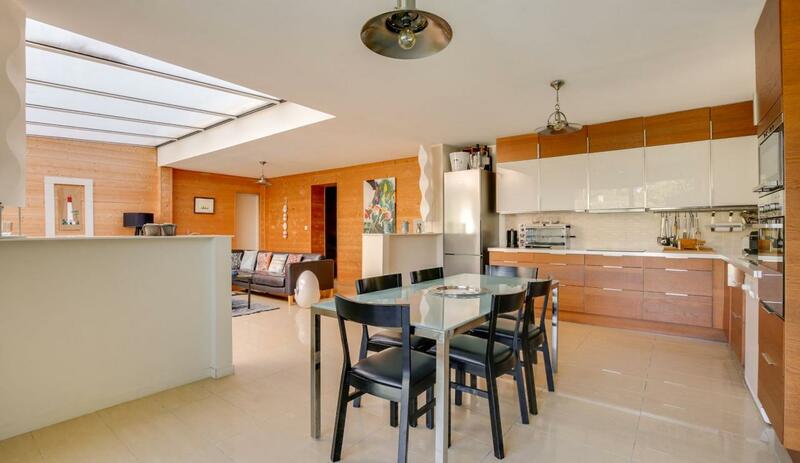 They are all modern facilities, reflecting the simple but well thought-out furnishings evident throughout. 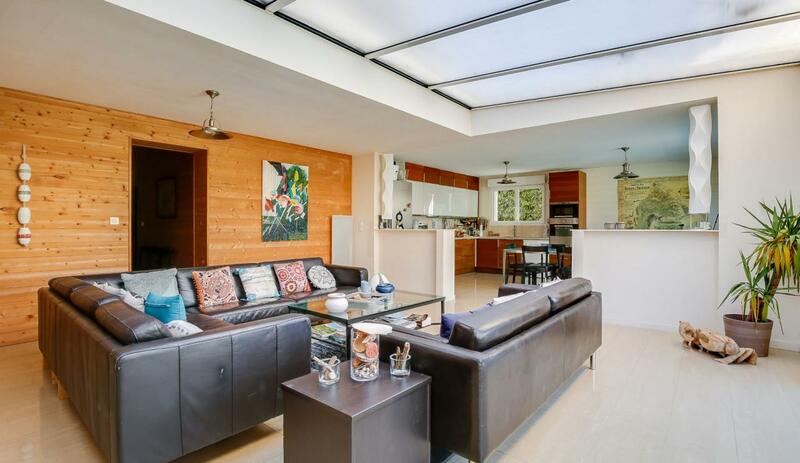 Next to the open-plan area (but separate to it, and with its own sliding doors onto the garden) is a TV room with sofa-bed, chairs, large-screen TV and wireless bluetooth speaker. This room also has an en-suite shower room. Completing the main accommodation downstairs are two further bedrooms - a double bedroom with sliding doors leading out onto a terrace at the side of the house (housing the first of the two king-sized beds in the property) and a further domitory-style bedroom with 4 single beds (lined up next to eachother) for the kids - no arguments about who goes where in this villa! 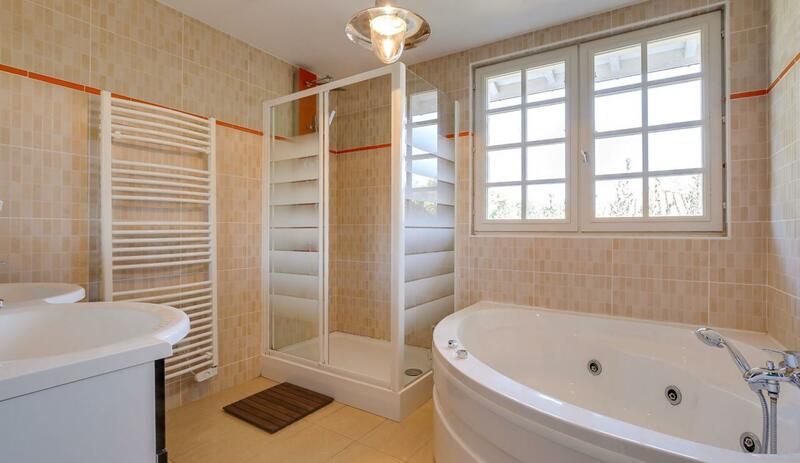 In addition to the en-suite, there is also a separate shower room downstairs. 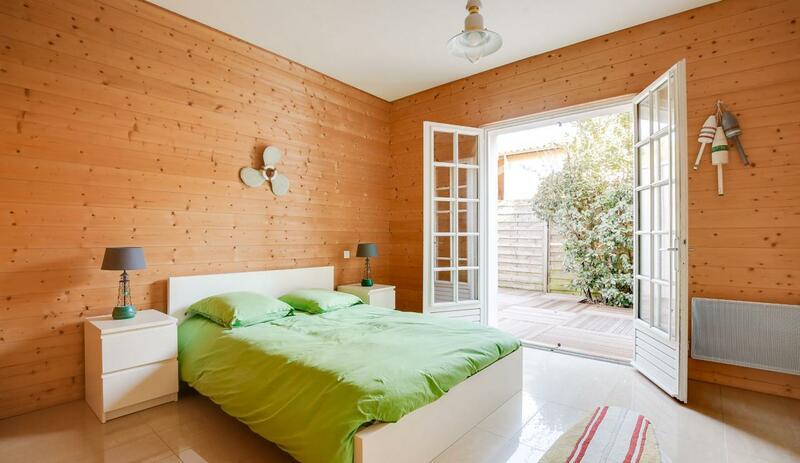 The upstairs accommodation comprises the master bedroom, separate bathroom and a lovely roof terrace. The roof terrace extends the length of the house, and accesses the garden via a flight of stairs at the side. 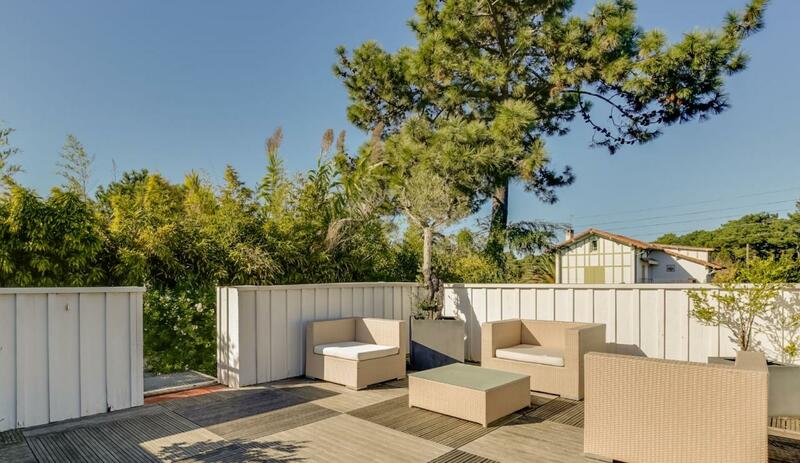 It offers a second outdoors space with seating, ideal for those wanting a little extra privacy in the sunshine. 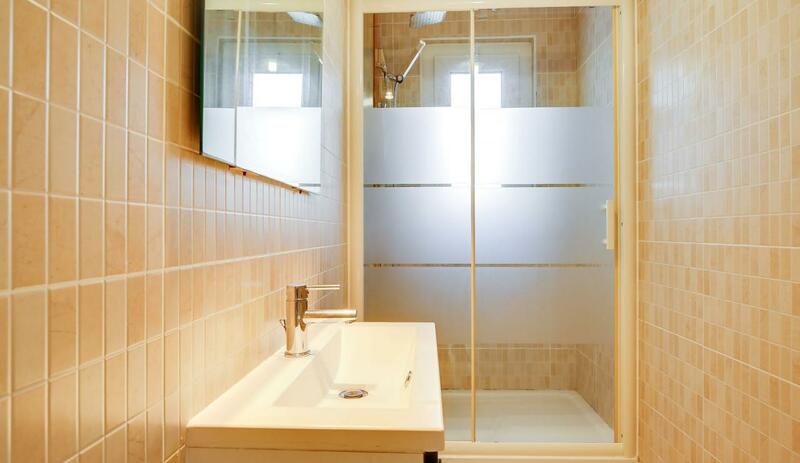 The bathroom on the second floor comprises jacuzzi bath, shower and double-basin. 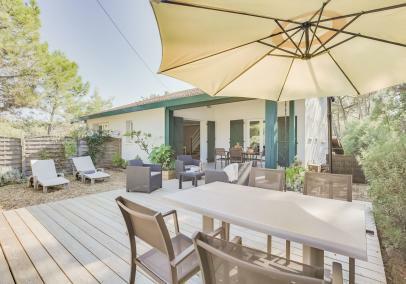 The perfect space to relax in, the garden of Villa Escale offers both outside dining on a table for 8, and a comfortable seating area for just chilling out by the pool. There's also a separate bar-style seating area leading out from the TV room. The pool measures 7x4 and has a depth of 1.80m - it heats up rapidly in the sunshine. Next to the pool there's also a good-sized grassed area for kids to play on. Parking is on the streeet in front of the house. 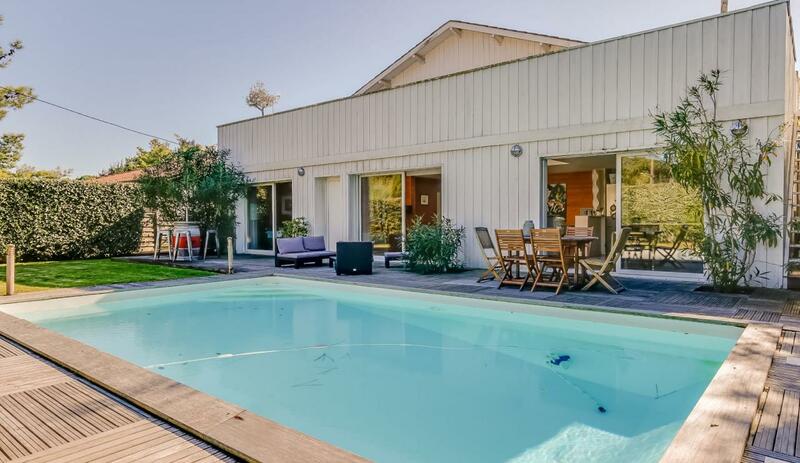 Set in the heart of Cap Ferret village, Villa Escale lies 250m from the Bélisaire jetty connecting Cap Ferret with Arcachon. 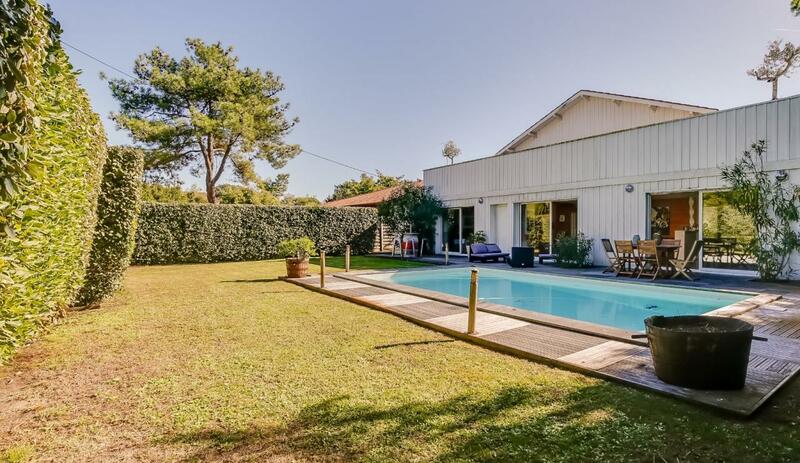 Although right in the bustling centre of Cap Ferret village, the villa itself is located in a residential area amongst the beautiful pine trees which characterise this peninsula. Take a short walk to the wide range of shops and restaurants nearby, or spend all morning browsing in the busy market - you can buy anything from fresh fish to jewellery. 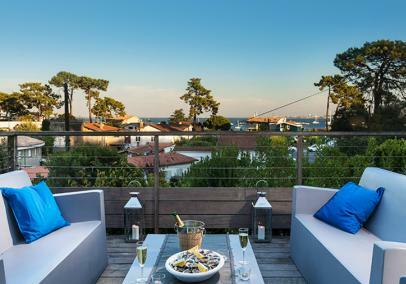 It's no distance either to the local beaches - you have the choice of the calm waters of the Arcachon Bay, with its spectacular oyster beds, or the miles-long stretch of beautiful Atlantic beach for the more adventurous.